When it comes to making flan and using the pressure cooker to make mean, savory meals, I have it mastered. But, I have to admit, there are still a few cooking methods that have me stumped. I used to think grilling was one of them. For the longest, it was almost another language to me. You know how we, as women, think: That’s for the guys to handle—turning on the gas, lighting up the fire, brushing the food, shuffling hot charcoal, etc. But if you’re like me—single and not the owner of an outdoor, king-of-the-backyard grill—you have to adjust the way you approach grilling. You still want to be able enjoy all the delicious foods we love on hot summer days. I’ve gone out and done some searching on essential tools we chicas need to have in order to create a fabulously delicious grilled meal, just in case the guy’s not around (until the food is ready!). 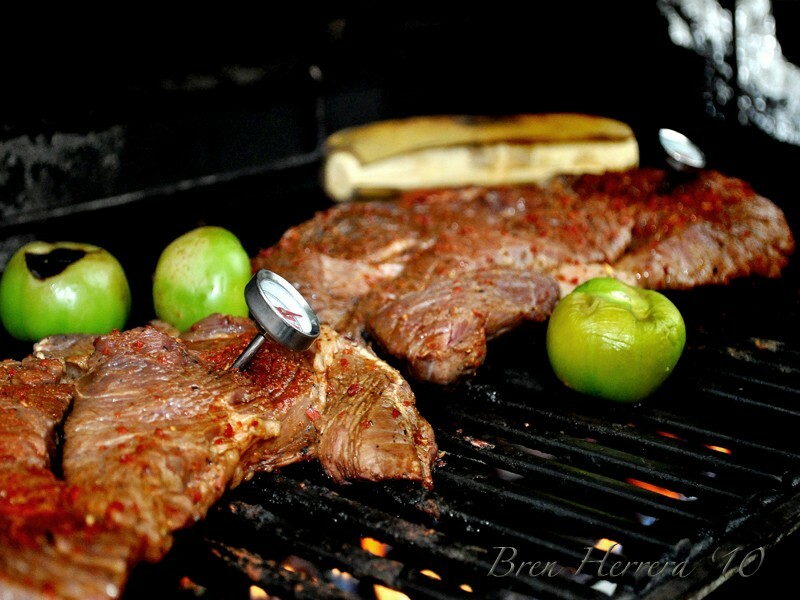 Wait, I have a teaser of the steak while I was grilling them … now you can read on and get the full recipe for the steak and tomatillo salsa and more pictures! 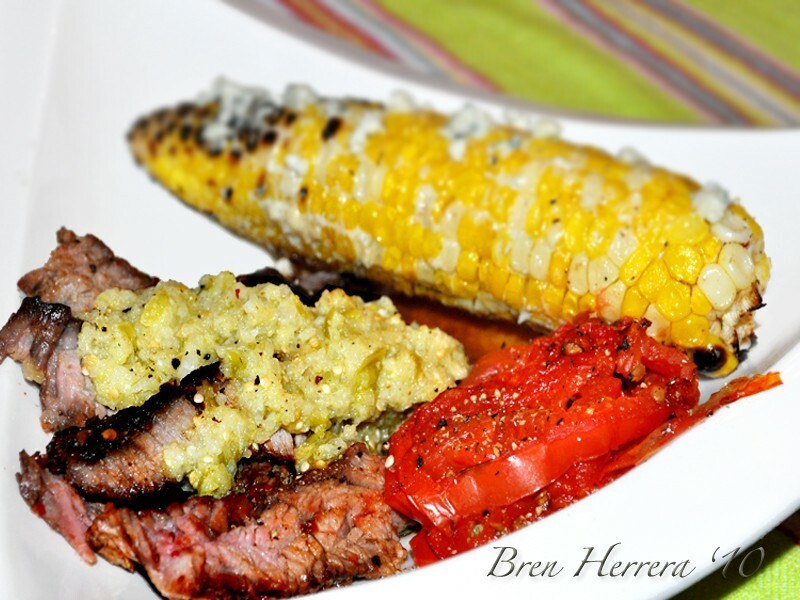 A great weekend lunch idea! Hey chef B lady it all looks wonderful as usual, Hey I got a Garlic Butter and Red Pepper flake steak I do that you would like I’ll send it to you email and you can blog it later. I was also checking out BlackTie BBQ and the photography by LeanandMark…Buena Photo’s I subscribed to news feeds. heading over to read on…. ;)looks delish! Nothing like a little red meat with a charcoal flavor seared on the outside. Then some nice roasted tomatillo salsa on top to give it just a little acid and bring out all that goodness. Mmmm mmmm then take a bite of sweet corn oh yeah there you go!!! And ribeye is my favorite steak it’s really prime rib cut into steak. Nice and marbeled and a great piece of meat. Leave the bone in and you have a cowboy steak. Try your corn the Mexican way which is called Elote. Grill it like you did then slather it with butter and mayonnaise and cover it with cotija cheese and chile powder then squeeze fresh lime juice on it. I guarantee you can’t eat just one piece it’s that good. Mark: just got your message. will play with your butter; though i’ve done something similar…Leah & Mark Rock! They covered my Culinary benefit for Haiti and then the Sugar Coma event I did a few weeks ago… super duper cool and talented couple! Thanks for coming by, again! Women on the grill! There won’t be anything else for the fellas to do but eat. NICE!!! Simone: It was mja! Super delicioso. April: wow, that early o, eh. I think I started when I went to college… but I don’t really remember; though I always did help out when we cooked out! Happy Memorial Day. Love the new look of your blog. We don’t barbecue often as we live in an appartment but whenever we do, my husband does all the grilling work. I just google searched to see what “malta” is and sounds like a very interesting ingredient for the marinade.